The 28-year old midfielder was an 85th minute substitute in Udinese's 2-0 win over Genoa in the Italian Serie A match. "Welcome back Emmanuel! It was beautiful to see you back on the field," Udinese tweeted, as he made his first appearance of the season having had surgery on his left knee in July last year. 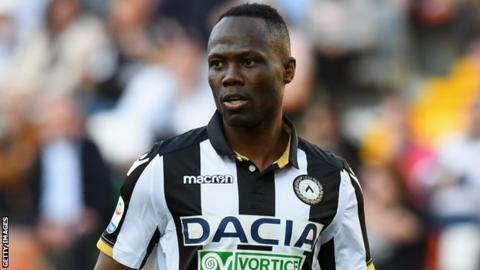 Agyemang-Badu did not feature for Ghana in their entire 2019 Africa cup of Nations qualifying campaign but he is now hoping to fight his way back into the Black Stars squad for this year's finals in Egypt.